This spring I toured a gorgeous private garden that is stunning for it’s beauty and classic garden design. I enjoyed strolling through the woodland gardens that were peaking with spring color and was struck by the innovative use of ground covers. No overly used big three – pachysandra, vinca, or ivy to be seen! There is a time and place for the big three, but consider the options before settling on the mundane. Why use a ground cover? Simply, it reduces the empty space around plants that will require weeding. Ground covers crowd out weed seeds that can migrate into the soil spaces between plants, germinate, and start the process of invading garden space. Plus it adds a finishing touch to the landscape. It is similar to putting on your jewelry once you are dressed. In practical terms, ground covers usually refers to any one of a group of low-lying plants with a creeping, spreading habit that are used to cover sections of ground which require minimal maintenance. Ornamentals such as hydrangeas could be used as a ground cover but more commonly low maintenance perennials like ferns are used to cover large expanses or slopes. Usually chosen for practical purposes, such as an area where it is too shady for turf to grow or too steep to mow, the selections are many. My favorite selections are for shady spots with some even performing well in dry shade. There are so many more interesting and attractive options, you just need to arm yourself with these choices and visit a good plant nursery. In addition, if you are a fan of the color blue, you will love these. So read on, and pick the best for your situation. Who ever thought about using Bluebells as a ground cover? It blooms beautifully and then disappears for another late comer like lamium or hostas to cover up. 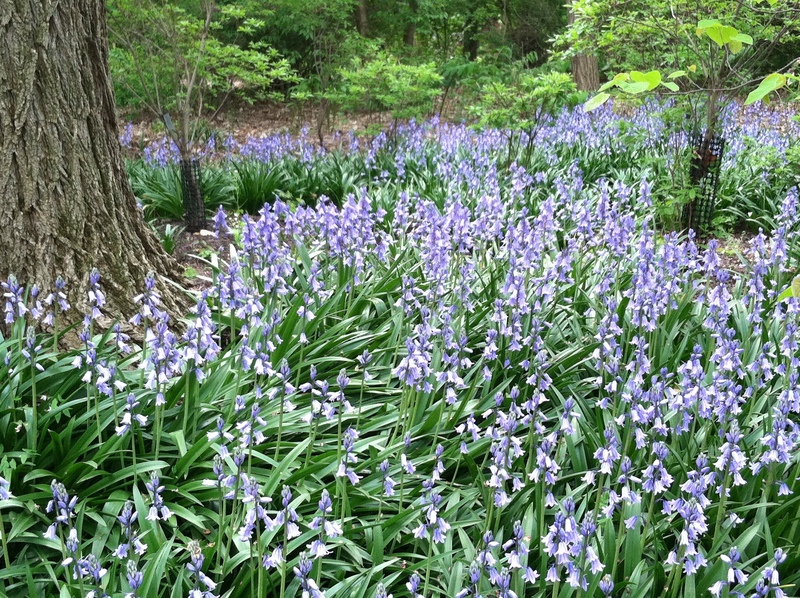 Spanish Bluebells, Hyacinthoides hispanica, is a great mid spring bloomer that spans the gap between the early arrivals of spring bulbs such as snowdrops, to the later arrival of mid summer perennials. Their best feature, other than the beautiful blue color, is that they bloom in deep shade as well as in full sunlight. You can naturalize them in a shady woodland underneath evergreen or deciduous trees and they will steadily increase over the years to carpet the ground in an azure swath. Bluebells are a bulb and come in pink and white as well, but the blue is my favorite by far. They are easy to grow in any woodland condition but will thrive where it is well-drained and with ample moisture. I grow them in my perennial borders with no special care and the foliage will disappear by midsummer. Because of this feature, you can underplant it with another creeping ground cover such as ajuga or sweet woodruff that can will take over once the foliage has died down. 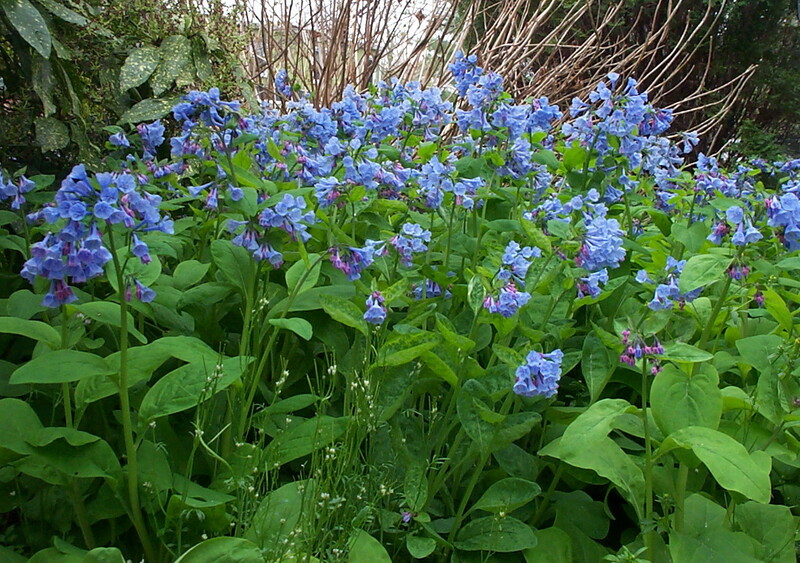 Virginia Bluebells, Mertensia virginica, is the native version of Spanish Bluebells. Instead of the strap like foliage of Spanish Bluebells, the leaves are very broad and tissue like in texture. The flower color is an intense cornflower blue. 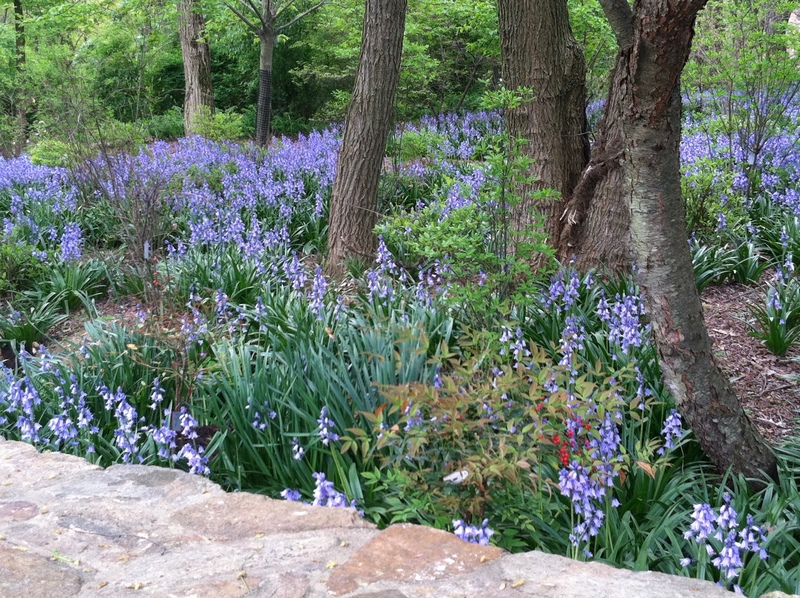 Virginia Bluebells are a spring ephemeral like so many early woodland bloomers, dying back to the ground. So be sure to have something else like the native woodland phlox to take its place. Later flowering annuals could be plugged into the spot that is empty when they die back or a perennial like late appearing hostas can do the job. Lamium or Dead Nettle has been mentioned several times already as it is a perfect little ground cover for bulbs to sprout though in the spring. A ground hugging creeper with silvered variegated foliage and some really pretty colored flowers, Dead Nettles are an ideal choice for gardeners who want a tough plant with a variety of foliage colors and textures. Tolerating a variety of light conditions, Lamium makes a good transition plant between shady and sunnier areas. The cultural adaptability of this great plant makes it a valuable tool in the gardeners planting palette. Woodland Phlox, Phlox divartica, is a native about 9 inches tall that comes in pastel blue, pink, and white. I love it, but find that it is a very short-lived plant, only three or four seasons. Who knew that there were so many kinds of phlox? Available in creeping, woodland, tall garden, and miniature alpine varieties, and some variations in between, most people are not familiar with the range of varieties available. 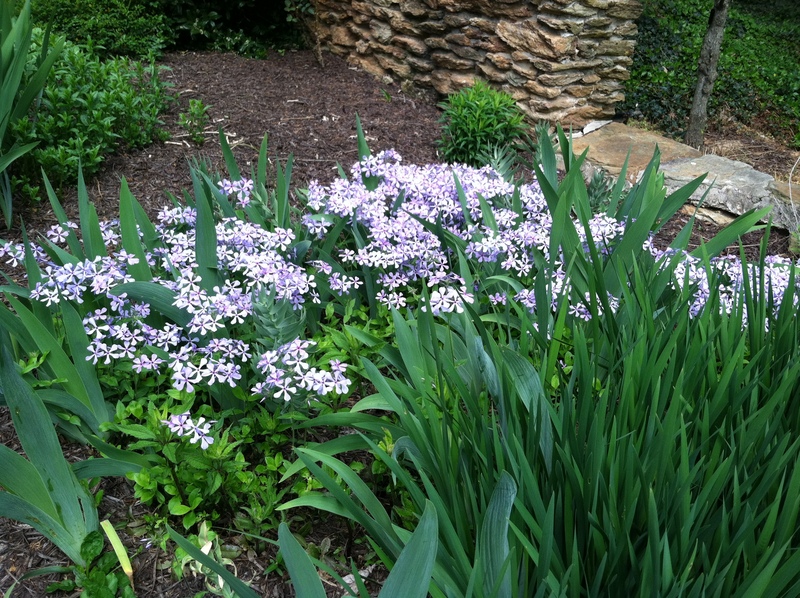 The Woodland Phlox is a very beautiful member of the family that blooms in April with a punch of color. 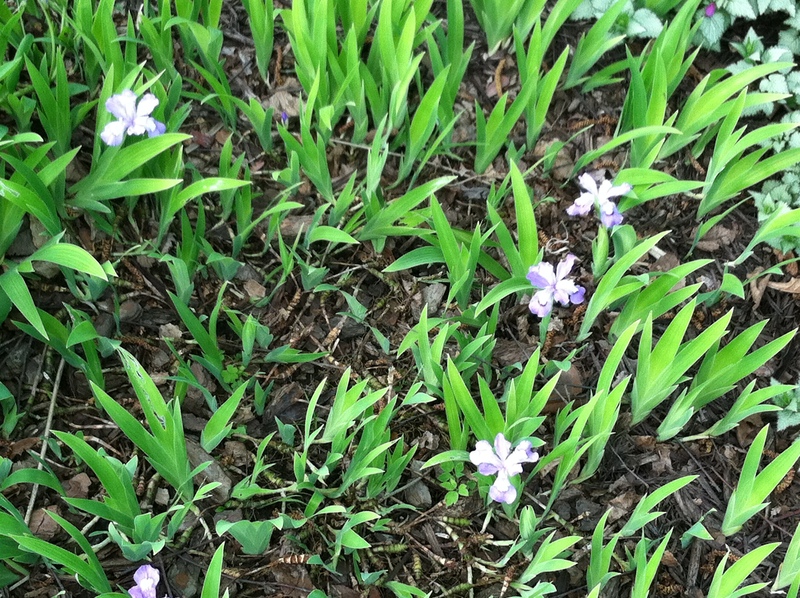 Another underused ground cover is the Crested Wood Iris, or Iris cristata. This diminutive little Iris is only about 6 inches tall and blooms with a miniature azure colored Iris bloom and will spread steadily but not aggressively. It is perfectly adorable! The deer ignore it also. 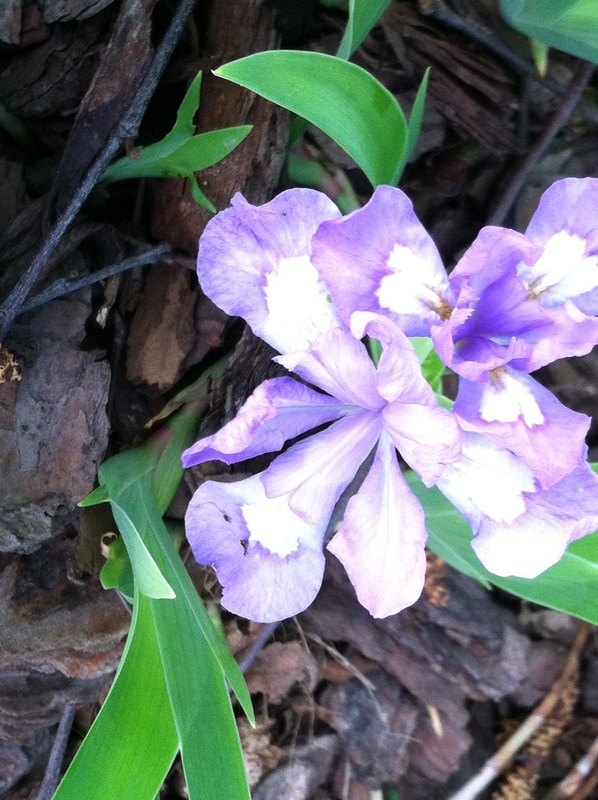 Wood Iris will bloom in very deep shade. 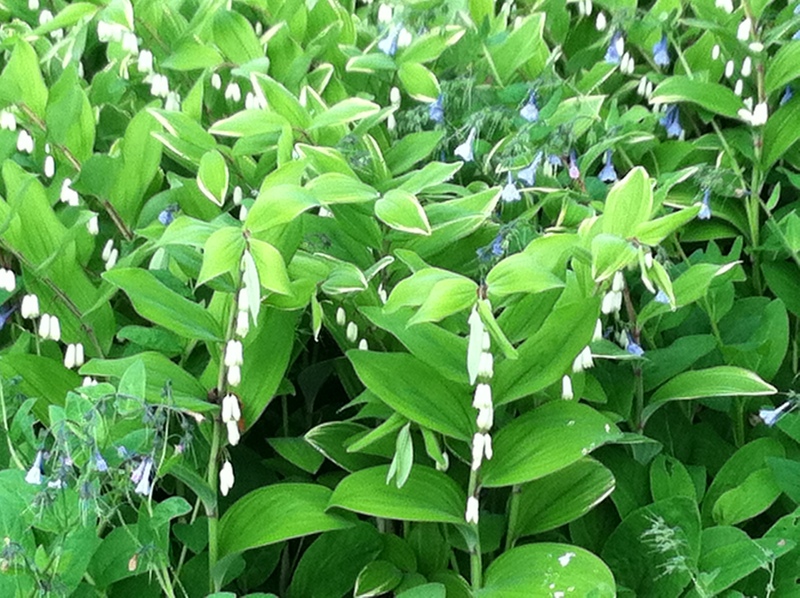 Solomans Seal, Polygonatum variegatum, is a workhorse perennial for me. Plant a small colony of a dozen, and after splitting it up regularly for several years, you will end up with a large swath of nodding white bells! Be warned – Deer do like to browse on them. This perennial will not thrive amongst others as it covers the ground with underground tubers and lasts all season long. Nothing else will grow where Solomans Seal takes over but a large drift is a sight to behold. Yellow fall foliage is a bonus, something that surprises me every year! 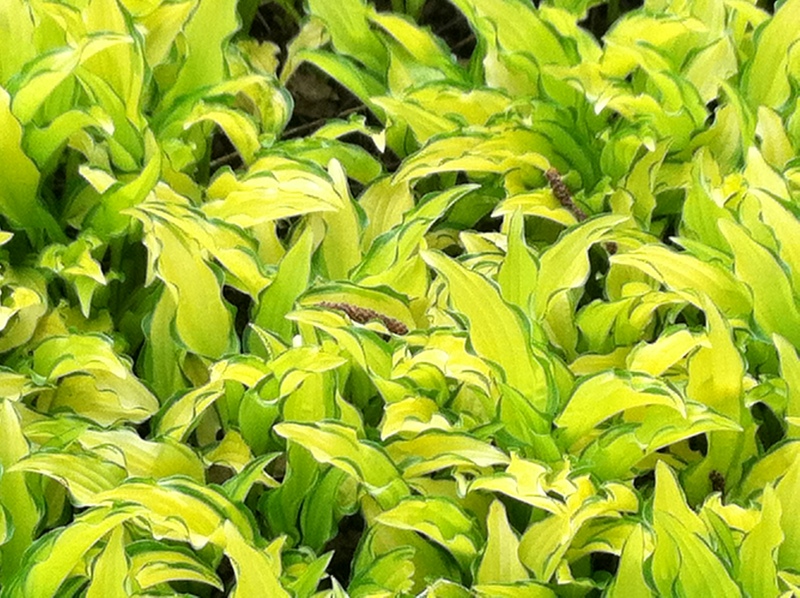 Just about everyone knows and grows hostas. A tough plant that is hard to kill, it is a deer magnet for browsing. But if bambi doesn’t roam nearby, try planting large colonies of the same variety for a great looking ground cover. Or vary your planting scheme for interesting textures and hues. 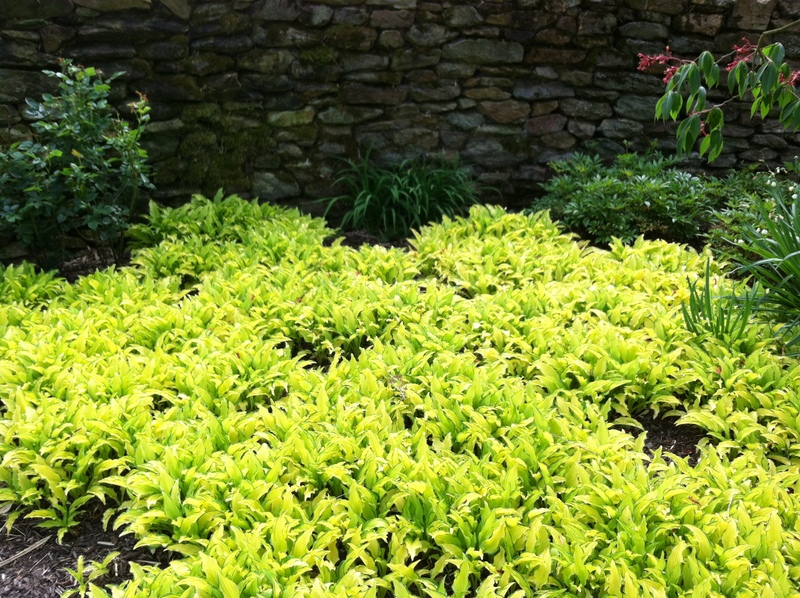 I find that hostas play well with other shade perennials and like to add clumps of them along with other ground covers. 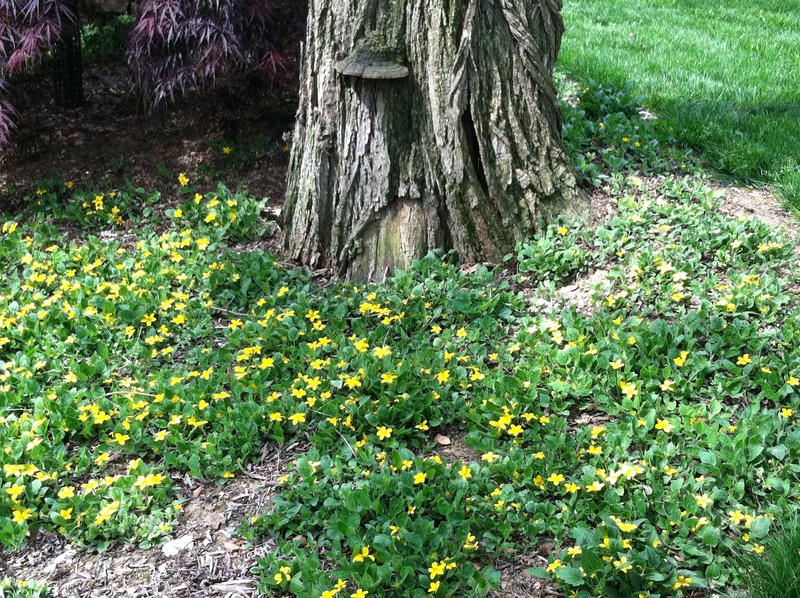 Another golden ground cover that will brighten a shady area is Green and Gold, Chrysogonum virginianum, or Golden Star. A native also, it is known for its star like flowers and creeping hairy leaves. Green and Gold loves moisture and will thrive in a boggy area. I grow it in ordinary garden conditions and it does just fine. It does need some shade or will burn in full sun. Deer leave this one alone! 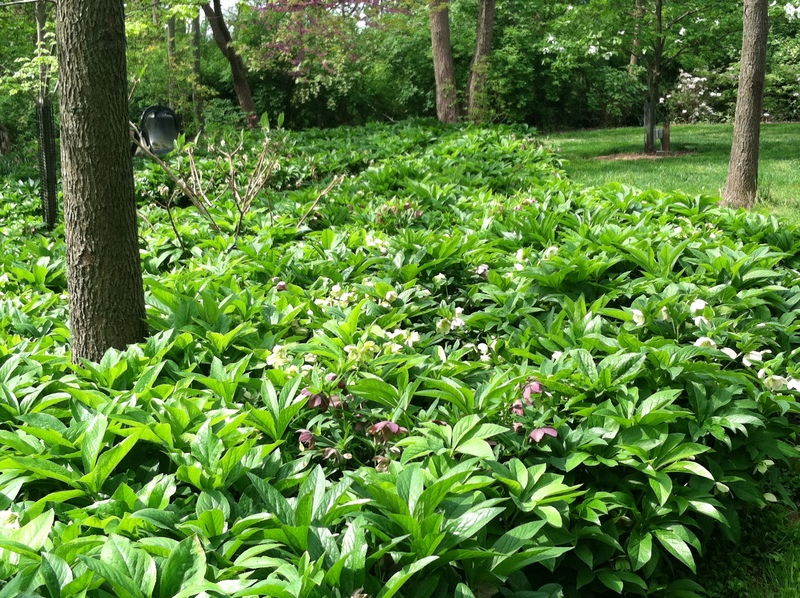 I have been advocating the use of Lenten Roses or Hellebores, as an evergreen, long blooming, deer resistant ground cover for years. The plants are a little pricey but will slowly fill in and throw off seedlings that will cover your ground before you know it. Did I mention that it blooms for three months, sometimes longer? Everyone who has a shady garden should grow these. Tough as nails, this plant will gradually increase in size every year. For more information, read my post, Hellebores-Deer Resistant, Low Maintenance, Shade Loving Perennial. I really hate that name! 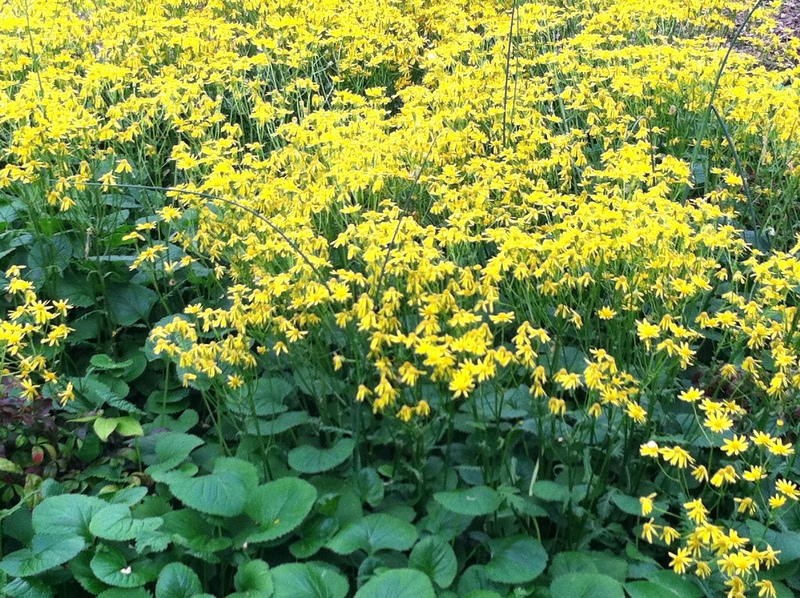 Golden Ragwort, Senecio aurea, is another native which I like to use in shady or semi-shady conditions. Senecio blooms with a cheerful daisy-like flower for weeks in the spring. The rosettes of deep shiny heart-shaped leaves are attractive the rest of the growing season. This ground cover will spread steadily and you might have to restrain it a bit, but it is definitely not a garden thug! 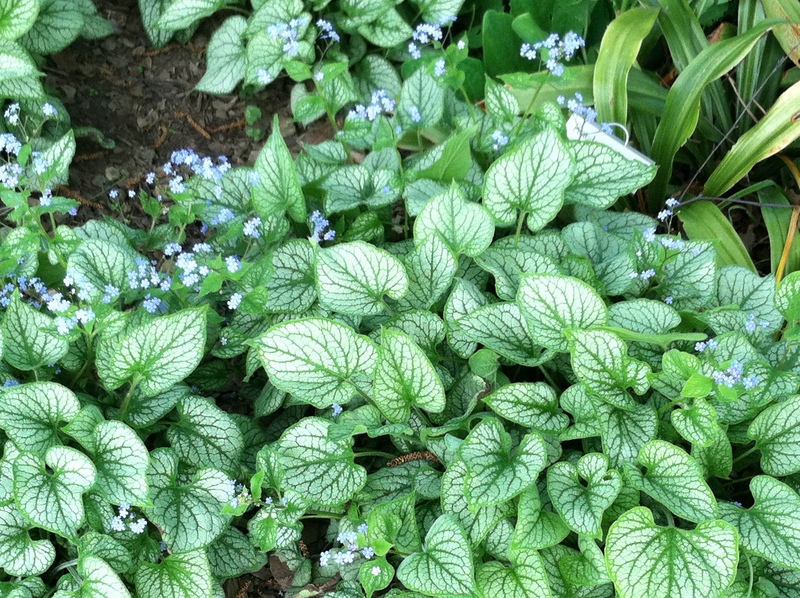 Another deer resistant ground cover which I recommend is Brunnera or Forget-me-not. This is the perennial Forget-me-not, not to be confused with Myosotis which is a biennial. Brunnera ‘Jack Frost’ was the perennial plant of the year for 2012 and deservedly so because of it’s beauty and toughness. Deer give it a wide berth because of the fuzzy foliage and it will hide early spring bulb foliage because it emerges right when the bulbs are dying back. ‘Jack Frost’ is a great cultivar with silver to white webbing on the leaf surface that shines in the shade. The plant is topped off with airy panicles of true blue tiny flowers. Perennial Geranium does well in part shade to shade and many of the varieties are deer resistant. Blooming with delicate flowers in the spring, these are tough perennials that will form nice weed smothering clumps. Mazus is a low-growing ground cover that spreads by creeping stems which root at the nodes as they spread. Growing only 2″ tall, this tiny creeper can spread pretty fast forming a dense, steppable cute ground cover. The foliage stays green for at least 9 months of the year and explodes in spring with purple tubular beautiful flowers. There is a white version also. 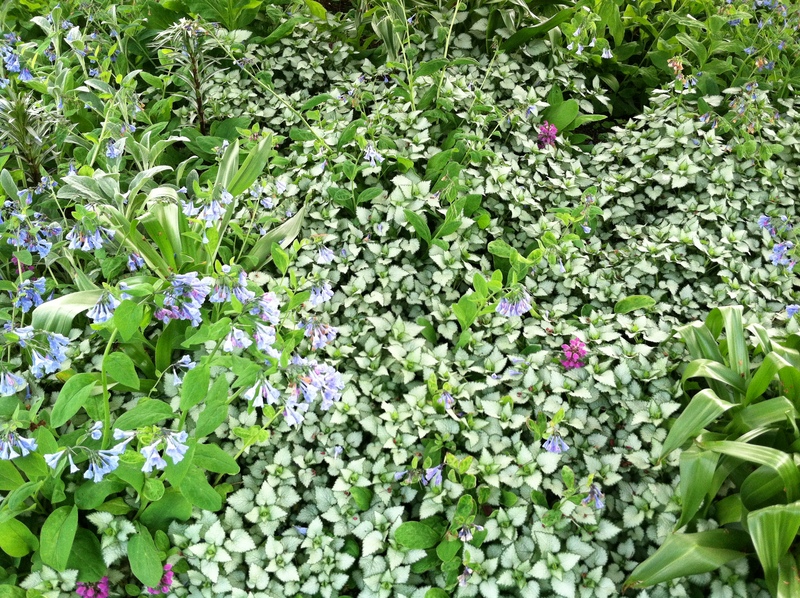 One of my favorite ground covers, I use Mazus whenever I have a smaller area like between stepping stones to cover. 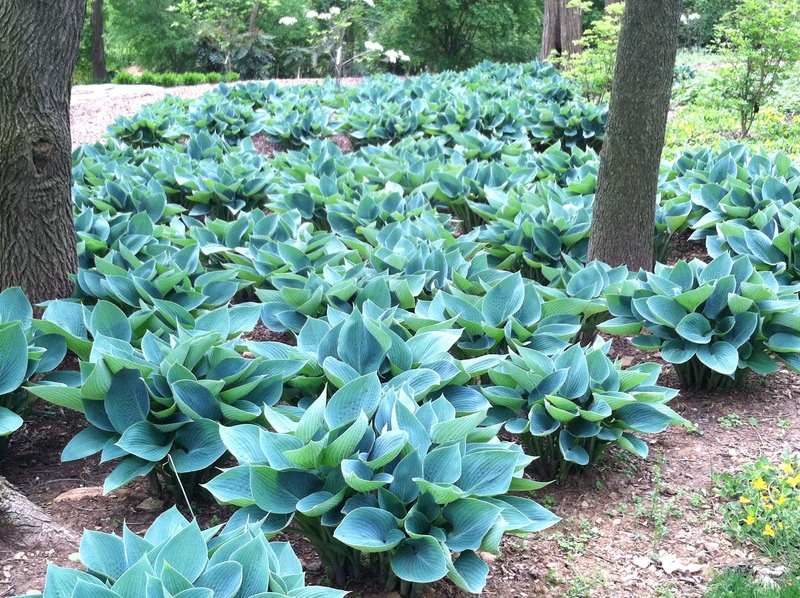 Euphorbia or Spurge is rarely seen as a ground cover and should be used as it can tolerate dry shade. 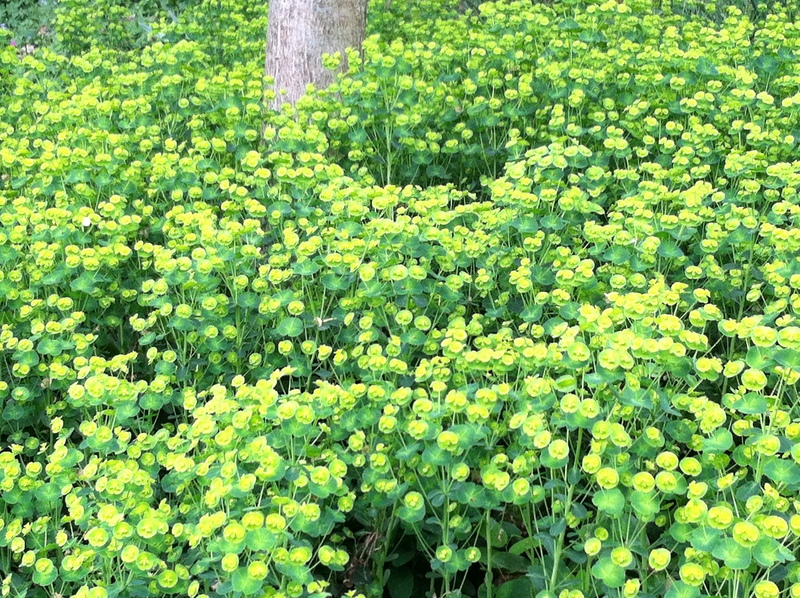 Evergreen and deer resistant, spurge is topped with lime green flowers in the spring. I am a sucker for the color lime. The color really brightens a dark area. Euphorbia robbiae easily grows in shade or sun and sports rosettes of handsome leathery leaves all season long. The ultimate in ground covers-Ladyslippers!